OTTAWA (CIS) – Canadian Interuniversity Sport announced on Tuesday a new three-year sponsorship agreement with Wilson Sports Equipment Canada, a division of Amer Sports. This partnership will see Wilson remain the official basketball and football supplier for CIS championship events through the 2014-15 season. “CIS is delighted to continue our partnership with Wilson Sports for another three years,” said Marg McGregor, chief executive officer of CIS. “Our coaches and players will be pleased because the quality of Wilson’s product is outstanding. Wilson’s long-term commitment to investing in university sport is unwavering. Wilson has been a long time sponsor of CIS as its official basketball and football supplier. The new partnership covers nine football championship events, including six Bowl games and three Vanier Cup finals, as well as three women’s and three men’s basketball Final 8 tournaments. “Wilson Sports Equipment Canada is thrilled that we are renewing our partnership with CIS for three more years, extending our relationship beyond 20 years,” said Jim Sanderson, Wilson business manager, team sports. “CIS has been an integral part of Wilson’s presence in Canada in two of our highest profile sports in football and basketball. Supporting the development of our university athletes is crucial in ensuring our sports remain healthy and thrive going forward. 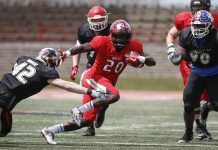 The 2012 CIS football season will culminate with the Uteck and Mitchell Bowls on Saturday, Nov. 17, followed by the 48th Vanier Cup final on Friday, Nov. 23 at Rogers Centre in Toronto. The 2013 CIS men’s basketball Final 8 – hosted by Carleton University – is set for March 8 to 10 at Scotiabank Place in Ottawa, while the women’s hoops national championship will be staged at the University of Regina from March 15 to 17. Throughout the 2012-13 campaign, CIS women’s basketball programs will once again hold numerous fundraising events for the Canadian Breast Cancer Foundation. Launched in the fall of 2007, the Shoot For The Cure initiative has since raised over half a million dollars for the CBCF and other local and provincial organizations. Canadian Interuniversity Sport is the national governing body of university sport in Canada. Every year, 52 universities, 11,000 student-athletes and 600 coaches from four regional associations vie for 21 national championships in 12 different sports. CIS also provides high performance international opportunities for Canadian student-athletes at Winter and Summer Universiades, as well as numerous world university championships. For further information, visit www.cis-sic.ca or follow us on Twitter, Facebook or YouTube.